New In Jumpshare For Mac: Sketch integration + Voice clips + Favorites tab + More! Jumpshare for Mac 2.1.1 is out with voice clip recording, Sketch integration, a new Favorites tab, local image annotation, support for Share Sheet and AppleScript, and optimizations for OS X El Capitan. Your uploads now go to My Uploads dashboard, but you can turn it off if you wish. Introducing Voice Recording! Sometimes there is no better way to communicate than using your natural voice. You can quickly start recording a voice clip by pressing Cmd+Shift+8, or clicking on the microphone icon in the Jumpshare app. Go ahead and sing, play a song, wish someone a happy birthday, or just leave a quick message. As usual, you will get a shareable link as soon as you stop recording. After working with Bohemian Coding – the great people behind Sketch – we’ve introduced the single most popularly requested feature in Jumpshare for Mac. You can now directly upload your designs from Sketch by just using the Jumpshare hotkey Option+D. You’ll get a shareable link copied to your clipboard immediately. Great for getting feedback from your team and clients! 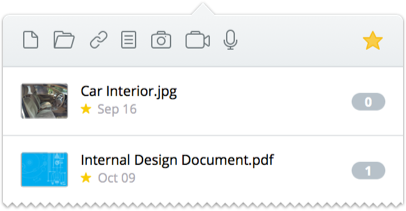 Mark important files as ‘Favorite’ and access them from the Favorites tab by clicking on the Star icon in the Jumpshare app. We use it to quickly access important files and folders and to share them again. Users love our screenshot annotation tools so much, they regularly take screenshots of other images just so they can annotate and upload with Jumpshare. We’ve made it easier for you! Just right-click on any image and go to Services > Annotate with Jumpshare. We have added support for OS X Share Sheets, so you can share files or links directly from any app that supports it. This significantly increases the number of apps Jumpshare can integrate directly with! Previously, Desktop Uploads was the all-in-one folder for anything uploaded from the Mac app. Based on your feedback, we’ve tweaked the Mac app so that all files now go straight to your My Uploads Dashboard on the web. As a result, it is now a lot easier to find recently uploaded files, screenshots, notes, etc. Now your web, desktop and mobile (coming soon) stream will be in sync! That’s not all though. With Jumpshare, you’re in control at all times. If you feel your dashboard is getting cluttered with too many screenshots, you have the option to upload screenshots, screencasts, notes, links and voice clips to “Desktop Uploads” folder, while general files and folders go to My Uploads dashboard. Jumpshare for Mac 2.1.1 comes with support for AppleScript! We’ve got nine scripting commands you can use to upload a file, take screenshots, record your screeen or a voice clip, or upload anything from your clipboard, etc. Adding Jumpshare to handle all your file-sharing needs in your already-existing scripts will boost your productivity even further. If you like the new update, please consider leaving a review on the Mac App Store. Amazing update with wonderful list of features. 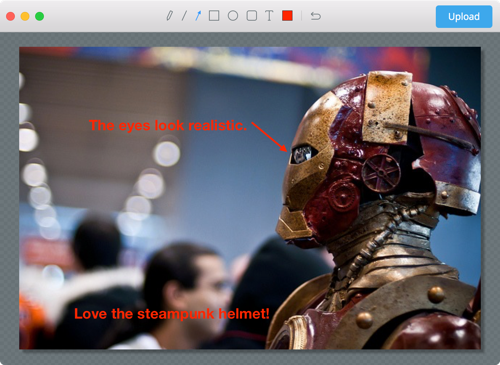 Annotating images is definitely a killer! Keep it up. opt + D…. The document “Untitled 2” could not be exported as “469447296739.sketch”. You don’t have permission.